This third live recording focuses on the band's work as a three-piece and was released as a double album in 1982. I must confess to being a little confused by the title when I bought it at the time, as all four sides contained live recordings, but this was due to there being an alternative version released for the US market which included the tracks from the band's '3x3' EP and a couple of rejects from the 'Duke' sessions which saw the light of day as B-sides. More on those later: but the original UK vinyl copy and the remastered CD will form the basis of my thoughts here. 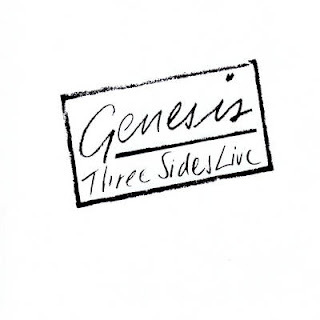 'Three Sides Live' is chiefly a record of the 1981 'Abacab' tour, with a couple of tracks from the 1980 'Duke' shows and material on side 4 from 1976 and 1978, featuring Steve Hackett and Bill Bruford. 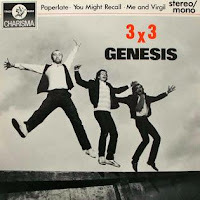 Otherwise the trio of Tony Banks, Phil Collins and Mike Rutherford are augmented by Daryl Stuermer on guitars and bass, and Chester Thompson on drums. The shows were held in Birmingham, New York, London and Glasgow. We open with 'Turn it On Again', and immediately from the off you get the sense of a huge auditorium as the cheers of the crowd introduce the song. The chugging chords seem to go on interminably before Collins brings in the keyboards with the customary '1-2-3-4'. It is a faithful rendition, with Collins scatting a little during the final chorus, and an extended climactic ending to counter the fade on the original. 'Dodo' follows, and here the keyboards seem to missing some of their top end early on. Collins vocal performance is very strong. The track segues into 'Lurker' (though this is not credited). 'Abacab' rounds off side 1, and the intro has a brief jam feel to it before the standard stuff kicks in. The bass (Stuermer?) seems to have few extra flourishes here than on the studio recording, and Collins jumps on the kit for the extended instrumental finish, which rocks out quite nicely towards the end. The appreciative screams of the Nassau Coliseum crowd in New York greet the opening strains of side 2's opener 'Behind The Lines', and they are equally vocal when Collins leaves the stool as the instrumental section ends. Phil is clearly engaging well with the audience here. The drum machine kicks in as the song morphs into 'Duchess', and Phil gives a great rendition of what is quite an emotional song, though the bass seems a little tame - needs more bass pedal for me. 'Me & Sarah Jane' is OK, but it misses some backing vocals in places to give it a bit more depth. I'm not convinced it works as a live track, to be honest. Side 2 wraps with their first big hit, 'Follow You Follow Me', which has the London crowd clapping along from the off. Side 3 is a contrast: it opens with 'Misunderstanding' which seemingly fails to pique the enthusiasm of the Savoy Theater Crowd in NYC until it ends - so no misunderstanding after all (! ), and then moves into almost 12 minutes of 'vintage' material flowing from 'In The Cage'. The song starts off a little on the slow side, but picks up and is soon driving along as only this song can. As it ends it morphs into the instrumental section of 'Cinema Show' (to the obvious delight of the crowd), with a short stab of 'Riding the Scree' included, and finally into 'The Raven' (not Slippermen, as it says on the sleeve). This gently segues into the perennial 'Afterglow' (which appears on 3 of the 4 live albums Genesis have released since the song was recorded): a good version of a good song. 'One For The Vine' opens side 4, and starts off a little slow and hesitant on the guitar/ piano intro before giving a fair if ponderous rendition, but the lack of Steve Hackett is clear. 'Fountain of Salmacis' follows, and opens well, but Collins seems to be struggling a little with the singing - possibly not quite in his best register. The middle instrumental section, though, still gives me goose-bumps! The album concludes with an amalgam of 'It' and 'Watcher of the Skies', recorded in 1976 and featuring Steve Hackett & Bill Bruford. It starts with some gentle drumming before the guitar comes in and livens up the crowd. Again Collins struggles with the words in places, but on the whole a stand-out version of a great tune. As'It' fades, and Phil says 'Thank you, see ya! ', we slowly transition into 'Watcher...' with its familiar Mellotron chords, but 'Watcher' without the words. But a fitting end to the show, which Ethel Merman once again brings to a close. Of the three lives outings so far in the Genesis canon, this has to be the most disappointing for me. One of the highlights for me of earlier live recordings was Phil's drum work, but this seems to be in short supply here, and it just doesn't thrill me in the way that 'Seconds Out' did, and still does. Just as a footnote, I mentioned above that the original US release had only 3 sides live, and the fourth was a collection of other studio material. 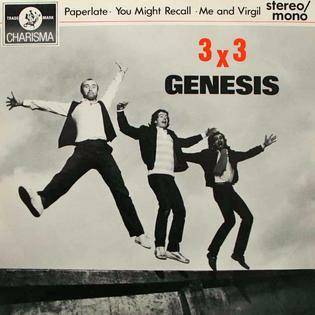 First were the tracks released as the '3x3' EP: 'Paperlate', a jangly, catchy tune, featuring the Earth Wind & Fire horns but with very little evidence of keyboards, whose title comes from Phil using the opening lines of 'Dancing with the Moonlit Knight' during sound checks; 'You Might Recall', which has a kind of Latin feel to the intro and bridge, and feels quite 'Duke-y', which may be why it wasn't used on 'Abacab'; and 'Me and Virgil', another of the Wild West songs, about growing up on a frontier farm in the 1880s, which has quite a heavy feel in the mid section and what sounds like a 12-string solo! Added to these were out-takes from the 'Duke' sessions, later released as B-sides: 'Open Door', a quiet, breathy ballad, which was very reminiscent of 'Alone Tonight' in places (possibly why it was dropped); and 'Evidence of Autumn', quite a moody piece to begin with (autumnal? ), with quite a quirky mid section, and clearly a Tony Banks composition. Of the five songs, I would say this is the strongest and perhaps deserved wider distribution than simply being the B-side to 'Misunderstanding' in the UK and 'Turn It On Again' in the US. So, I'm not sure who had the better deal in the end: the US or the UK. Both 4th sides contain some excellent material, so whichever side of the pond you are, at least the album ends on a great note.